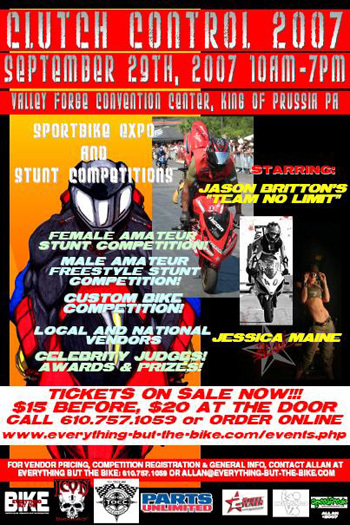 On Saturday September 29th at the Valley Forge Convention Center, Clutch Control 2007 will bring some of the top names in the industry to the Philadelphia region for the first time to take part in this inaugural sportbike expo/stunt competition. - The 1st ever all female amateur stunt competition in the greater tri-state area with awards and prizes. - Male amateur stunt competition with awards and prizes. - Custom bike show with awards and prizes. To start the weekend off, Everything But The Bike will host a massive street ride through the city of Philadelphia on Friday, September 28th. All rides and crews are welcome. Don't forget to come visit the UpOnOne.com booth and say hello!